Everything starts with our thoughts and that’s why we should become more aware and consciously choose our thoughts. It should be noted but this quote has started me on a life-long self-improvement journey. This quote has really resonated with me and I used it when I facilitated my very first workshop at Magna (while is still was a Magna employee). It is true, whatever we believe with conviction will become our reality. Our mind is very powerful and that’s why it is important to become more mindful in our daily interactions. How we think and feel and what we do will determine the results in our life. Over the years I have worked really hard on becoming a better person because I think this is what life is all about. I want to become a better person by learning from the people around me and from my mistakes. 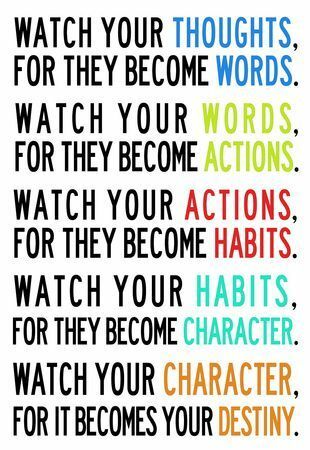 I often wonder why people in organizations don’t put more emphasis on the character of a person. I think having outstanding skills and knowledge is good but if you combine them with good character, people will receive better personal and professional results. Now that I made you curious, what really are the character traits that make for a good character in a person but especially in a leadership role? As always, I encourage you to work harder on yourself than the people around you. This is how you will get further faster. Just saying!